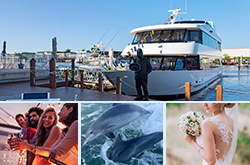 Join us for a Naples, Florida sightseeing tour, lunch or sunset dinner cruise or private charter! Welcome Aboard! Come cruise with us aboard the most elegant luxury yacht in all of southwest Florida. You will experience the spectacular homes, breathtaking sites and natural beauty of Naples Bay and Port Royal. Relax in our fully enclosed and air-conditioned interior salons or bask in the warmth of the sun in the fresh-air outdoor seating. Enjoy the beverage of your choice from either of our two full-service bars and unwind as we cruise the calm waters of Naples Bay. If you join us for dinner, hors d'oeuvres or lunch cruise, you'll enjoy a delicious meal prepared fresh daily, right in our galley. The Naples Princess sails from her dock at the Port-O-Call Marina, Naples, FL - conveniently located near downtown Naples, directly adjacent to the shopping of Tin City, Naples, Florida. Join us for one of our popular daily public cruises where you're sure to have the experience of a lifetime. We also invite you to arrange a Naples private charter to make that special occasion unforgettable. The Naples Princess offers a number of different cruise experiences on a daily basis for all to enjoy. Whether you have a small group, your family, or just yourself looking to take a relaxing cruise on a beautiful luxury yacht, we have something for everyone. For all the latest details on our public cruises and specialty cruises open to the public, please see our Naples Cruises page. Also visit our Calendar of Naples Cruises to plan your time with us in advance and ensure your place on one of our cruises. Our Daily Public Cruises include Naples Sightseeing Tours in the afternoon or at sunset where you will cruise Naples waters, Port Royal and the Gulf of Mexico, Sea Breeze Lunch Buffet Cruise during the mid-day sun, Naples Sunset Dinner Cruise, a local favorite and one of the best things to do in Naples, and our Sunset Cruise with "More than Hors D'oeuvres Cruises". See a Calendar of Naples Cruises to plan your time with us in advance and ensure your place on one of our cruises. Join us for a sightseeing, lunch, or sunset cruises aboard the Naples Princess! Naples Princess Cruises offer opportunities to soak in the sunshine, shoot photos of historical landmarks and marvel at exclusive waterfront estates. You'll also spot marine animals and soaring seabirds, making this the most enticing sightseeing and wildlife watching around. We are thrilled to offer you many opportunities to join us aboard the Naples Princess. Our daily public cruises of Naples Bay allow you to share the experience of this magnificent vessel with friends and family. Always a great value, we offer a wide selection of cruises to choose from, ranging from sightseeing cruises, gourmet sunset dinner cruises, live entertainment specialty cruises, and more. All of our cruises depart daily from the docks at Port O Call Marina, near downtown Naples and adjacent to Tin City. Our cruise route travels through Naples Bay to view the spectacular homes in Port Royal and out to the Gulf of Mexico to view Naples' most magnificent sunsets and pursue the elusive "green flash". Don't forget your camera! Look closely and you might just see a dolphin family swimming by as we glide through the calm waters! And you never know when we'll encounter eagles, egrets, and other marine & estuary wildlife. You're welcome to arrive 30 - 45 minutes early, check-in and board at your leisure. We have two full-service cash bars on board to fulfill your every request. Sip on your favorite tropical drinks, frozen or fresh. Not sure which cruise to take? Check our full cruise calendar to select the trip that fits your schedule! Cruise Naples waters, Port Royal and the Gulf of Mexico in air-conditioned comfort and luxury with our narrated tour on the new 105' Naples Princess Luxury yacht. Sit back and relax while enjoying world class service. You can choose to sit on our upper level sun deck or relax in one of our climate-controlled salons. Every seat on the boat has great views of the sights. In addition to our regular mid-afternoon Sightseeing Cruises, we offer sightseeing-only cruising options on any of our regular public cruises listed on this page. So come join us at lunchtime or sunset, even if you want to skip the meal and just take a relaxing boat ride. Enjoy our Sea Breeze Lunch Buffet while we cruise the waters of Naples Bay and the Gulf of Mexico in air-conditioned comfort and luxury. You'll also enjoy our narrated tour of the Port Royal and Royal Harbor waterfronts, and view local wildlife including eagles, playful dolphins, herons, pelicans and more. Whether you're on vacation, celebrating a special occasion, or just looking for a wonderful meal in a beautiful setting, you'll thoroughly enjoy your experience on our lunch buffet cruises. 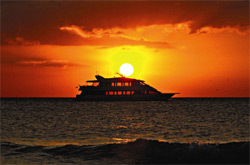 The Naples Princess Sunset Dinner Cruise is a local favorite and one of the best things to do in Naples! You will be treated to an unforgettable double-entree dinner served with fresh salad, vegetables, potato, dessert and coffee while viewing the incredible sunset. Each cruise includes a narrated tour of Naples Bay, Port Royal and Royal Harbor. We'll cruise out through Gordon's Pass and into the beautiful Gulf of Mexico where you'll enjoy the peaceful beauty as the sun descends slowly into the distant horizon. Our "More Than Hors d'oeuvres" sunset cruises offer you two hot and two chilled, freshly prepared hors d'oeuvres plus a scrumptious dessert, served against the backdrop of a beautiful sunset. The items served vary each night and are selected specially by the chef. However, as a sneak peak... we may serve items such as tropical fruit, distinctive cheese tray with crackers, BBQ meatballs or carved beef with fresh rolls. The setting sun makes for a perfect atmosphere while you enjoy the great food paired with your favorite drinks from our two full service cash bars. The cruise also includes our narrated tour of the Naples Bay area, including commentary on the stunning homes of Port Royal and Royal Harbor. Your captain will guide the Naples Princess through Gordon's Pass and into the Gulf of Mexico, where you'll witness the magnificent sunset that is an experience unique to southwest Florida.